Okay, it's known beets aren’t exactly everyone’s go-to vegetable and not the biggest hit on your meal planning playlist. (Except if you love borscht.) So Hardbite has taken this undervalued veggie and transformed it into a totally tasty treat! Why? Because everyone loves a good beet. 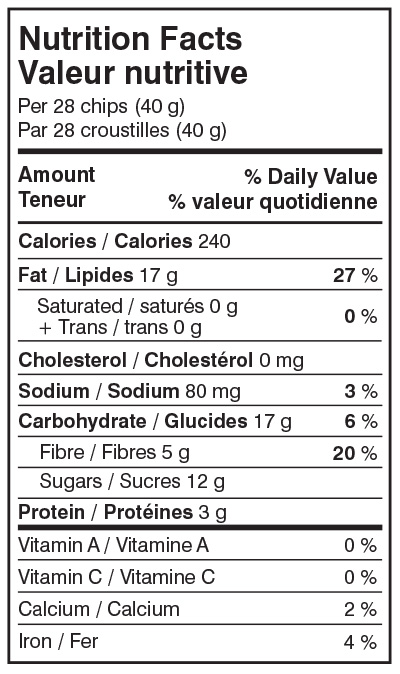 Ingredients: Beets, non-hydrogenated sunflower oil and/or non-hydrogenated canola oil, sea salt. 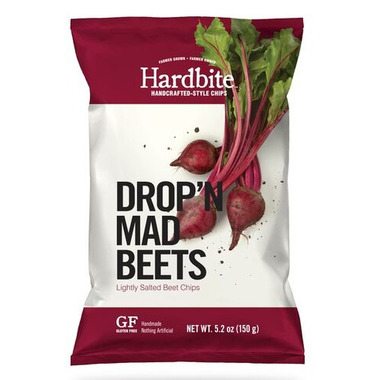 If you like beets, you will love these beet chips. Satisfying crunch, great chew, nicely salted, & delicious beet flavour. I enjoy them straight out of the bag and, also, crumbled onto salads. The only drawback is that I find it very easy to over-indulge - after all, they're still "chips". Kind of greasy. Very earthly flavoured. Will buy again likely as a small mid-day snack. These are absolutely my favorite chips. I have them daily! They add a nice crunch to my meals and I love how tasty and rustic they are. Love them! These are delicious and nicely salted. They do tend to be a little tough but I didnâ€™t mind that so much. Would buy them again for sure. Not overly impressed. I found the chips all tasted burnt. Perhaps its the nature of beets, but wouldnt buy again. These are delicious and a perfect paleo friendly snack. Excellent crunch and flavour and worth the price. I have to really force myself not to eat the whole bag in one sitting. You will need to hide this bag if you want some for yourself. The 4/5 rating is only because these are expensive, but I suppose that's the price you pay for healthy ingredients. Since I have a health condition which limits my tolerance to many ingredients, even healthy ones, I do wish they weren't possibly made with canola oil, and I wonder what they'd be like with coconut oil instead of sunflower oil. Otherwise, these have a great flavour and crunch, and I haven't found the ones I've tried to be too oily! An awesome alternative to potato chips, which I can't eat! Loved them, so what if they are a bit oily, you have got to feel like you are cheating!!! These chips like the parsnip ones are EXTREMELY OILY - I'm again disappointed. They are like many other 'natural' vegetable chips out there - saturated in oil and tasteless. The quest continues ! these are the best chips ever!!! Delightful flavour! A very nice change from ordinary potato chips. Especially appreciated if you love beets as much as I do! Best beet chips anywhere! Thank you so much for the excellent delivery. These chips are lightly salted and amazing. On a whim,I bought a bag at Marshalls checkout,and was addicted! Try these healthy beets , you will be addicted too! Better than I thought they would be. I'm not much for beets but love beet borscht... Go figure. Lol. I would buy again. I bet the batches change slightly in sweetness level depending on the natural sugars in the beets. These chips are salty if you are craving salt, but they are also very greasy and the ones in my bag have very little crunchy. I had been hoping, particularly given the name, that these would have more texture. They are tasty, but a healthy alternative to potato chips they are not. Definitely greasy but delicious, a treat that you can eat only a few chips at a time. Flavor wasn't what I was expecting. To greasy. The chips in my bag were more like crumbs. No large chips. They might taste better on a salad or added to other food. I would only buy again if they are super cheap. I've had much better. Very salty and greasy. The grease had an odd flavour to it that over powered the beet flavour. These are supposed to be Lightly salted. That is not the case - the maker had quite a heavy hand ! Also, quite greasy. I liked the idea of beets chips, but those definitively did not the trick. Too salty and oily. Had to use them as a 'salad topper' since the taste was too overpowering on their own. Did enjoy them as a topper though! We shared these chips with friends and the 8-15 year old children really enjoyed them... as well as the adults. As far as we were concerned they were a great treat... and no one is a special lover of beets. only 4.5 out of 5 due to oily chips at the bottom of the bag. I wanted an alternative to potato chips - love these. The only reason I didn't give 5 stars is that I wish they were saltier, but that's easy to fix - I just add some here at home. As a low carb eater I find these chips are amazing! So I have now purchased the parsnip and carrot chips of this brand as well as the beet ones. I like the carrot and parsnip ones so I had high hopes for these but I could barely choke down one chip. Very sickly sweet and not appetizing. I will likely end up tossing the rest of the bag. Would not purchase again, but maybe if you LOVE beets you will enjoy these.